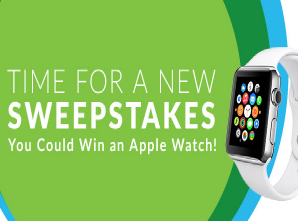 Simple Green’s March 2016 Sweepstakes – Win an Apple Watch! ENTER SWEEPSTAKES HERE – Simple Green Sweepstakes page. ENTRY LIMIT – Limit one entry per person or e-mail address per weekly sweepstakes. ELIGIBILITY – Open only to legal residents of the 50 United States and the District of Columbia (excluding Guam, Puerto Rico and all other U.S. and foreign territories and possessions), who are physically located and residing therein and are 18 years of age or older at time of entry. SWEEPSTAKES ENTRY PERIOD – The Sweepstakes starts on or about March 14, 2016 at 12:00 a.m. Pacific Time (PT) and ends on April 10, 2016 at 11:59:59 p.m. PT. Sweepstakes Period 1 begins March 14, 2016 and ends March 27, 2016. Sweepstakes Period 2 begins March 28, 2016 and ends April 10, 2016. One (1) Grand Prize: One (1) Apple Watch 38mm Silver Aluminum Case with White Sport Band (ARV: $349.00); One (1) Simple Green All-Purpose Cleaner 32oz (ARV: $4.15). Five (5) Second Place Prizes: Simple Green VIP Cleaning Kit (ARV: $34.99 per kit). One (1) Grand Prize: One (1) $100 American Express gift card (ARV: $100.00); One (1) Simple Green All-Purpose Cleaner 32oz (ARV: $4.15). Five (5) Runners Up Prizes: Simple Green VIP Cleaning Kit (ARV: $34.99 per kit).